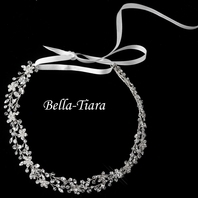 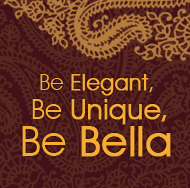 Darcie - Elegant double row vintage crystal Bridal headband - SALE!! 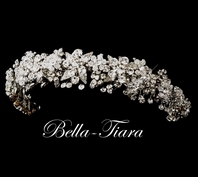 HOME / WEDDING HEADPIECES / Wedding Headbands / Darcie - Elegant double row vintage crystal Bridal headband - SALE!! 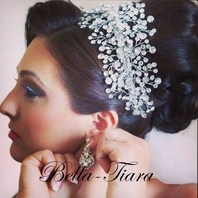 Description: Vintage inspired and sparkling, this headband features a rhinestone encrusted double band and a side ornament of a rhinestone flower and an airy spray of Swarovski crystals and silver plated leaf details. 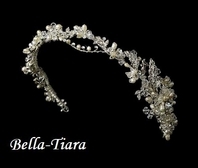 Perfect for the vintage bride, bridesmaid, or flower girl. 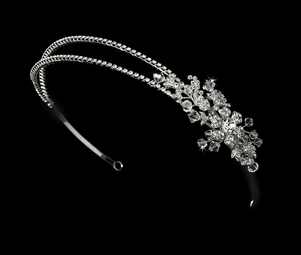 The ornament measures 3-1/2" wide and 1" tall, and the piece ends in two loops that allow you to fasten it in your hair with bobby pins.